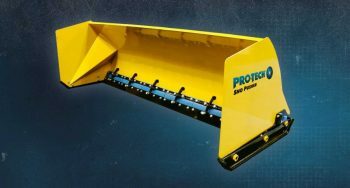 The new and improved Steel Edge Sno Pusher effectively attacks all types of surfaces, especially those that are uneven or covered in hard packed snow. This snow pusher’s ability to scrape hard pack snow and ice can even reduce salt usage for some customers. 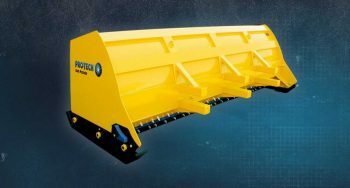 Also, unlike a sectional snow pusher or other steel edge containment plows that have complicated trip edges, the Steel Edge Sno Pusher has minimal moving parts and uses a corrosion resistant poly urethane hinge instead of springs, bosses, levers. The Steel Edge Sno Pusher has no stacking or speed limitations so push that pedal, drive into that pile of snow, and get the job done better and faster. IS10L 10′ 2300 lbs. Loader – 1.25 yd. 52″ 48″ x 62″ 13 yd. IS12L 12′ 2400 lbs. Loader – 1.50 yd. 52″ 48″ x 62″ 16 yd. IS14L 14′ 2550 lbs. Loader – 2.00 yd. 52″ 48″ x 62″ 19 yd. IS16L 16′ 2700 lbs. Loader – 3.00 yd. 52″ 48″ x 62″ 22 yd. IS18L 18′ 2950 lbs. Loader – 3.25 yd. 52″ 48″ x 62″ 24 yd. IS10B 10′ 1500 lbs. Backhoe – 2×4 40″ 40″ x 52″ 10 yd. IS12B 12′ 1650 lbs. Backhoe – 4×4 40″ 40″ x 52″ 12 yd. IS14B 14′ 1800 lbs. Backhoe – 1.20 yd. 40″ 40″ x 52″ 14 yd. IS06S 6′ 800 lbs. 36-46 HP 40″ 40″ x 52″ 6 yd. IS08S 8′ 950 lbs. 46-70 HP 40″ 40″ x 52″ 8 yd. IS10S 10′ 1100 lbs. 46-70 HP 40″ 40″ x 52″ 10 yd. IS12S 12′ 1250 lbs. 85+ HP 40″ 40″ x 52″ 12 yd.